An exciting new scheme of nine spectacular townhouses a stone's throw from the River Thames in this highly sought after Fulham location, by renowned developers Octagon.These elegant properties have been impeccably designed to offer the finest contemporary living with a range of high end specifications. 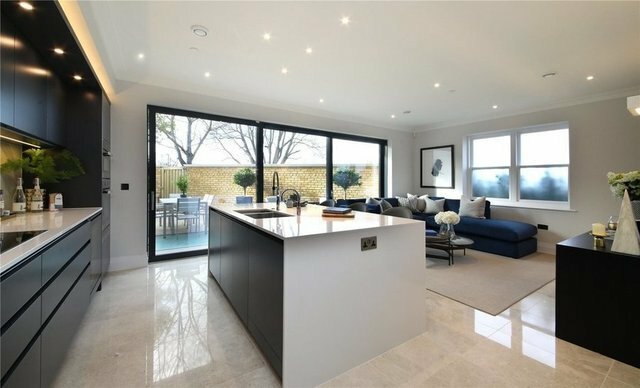 Features include: handcrafted kitchens with modern linear handless cabinets, quartz worktops and top-of-the-range integrated Miele appliances, marble flooring in the entrance halls, elegant bespoke staircases and fully landscaped and planted gardens. The drawing rooms come with a modern limestone fireplace complemented by a timber flooring and inset carpet. Timber flooring further features in the studies, gyms, cinema suites and remaining reception rooms, whilst all bedrooms are fitted with high grade quality carpets. Innovative outdoor space includes covered lower courtyard gardens with a "walk on" glass floor, and landscaped green space to the front and rear of the property. Drawing rooms and master suites feature private balconies, whilst the pièce de résistance in outdoor living comes in the form of the roof top terraces which give residents unbeatable views over the River Thames.